Who are we and why hire us ? We are one of the leading Canadian companies that surpasses client expectations and drives them to the next level of success. Our Service is a professional resume writing service; customized to market individuals in their fields and establish them as a force to be reckoned with on paper. If you are looking to go to the next level and get hired—then we are your partners for moving forward. Best-Rated Resume Company in the Alberta Market and a member of the largest 3 Resume Writing Associations. We pride our selves as having the highest success rate in the market—having assisted thousands of clients from C-Level Executives to New Graduates and Students. We write executive-power house resumes, customized cover letters, LinkedIn development, job search and interview training and coaching—to boost you among 1000+ applicants. 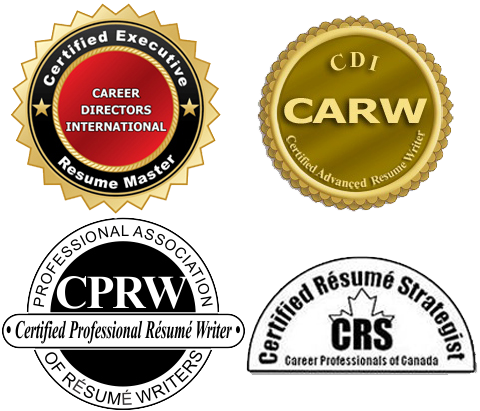 At Edmonton Resume Services, Our Professionals Resume Expert Writers are highly experienced in all industries. Unlike most Resume Services in Edmonton, we meet all of our clients face to face in person guaranteeing a welcoming in professional office experience. We prepare customized and generic cover letters, according to our client’s preference; we make sure that our Resume Preparation process is always tailored specifically for each client needs to guarantee more opportunities for job interviews. Our Professional Resume Writers Team always goes above and beyond to ensure our client’s satisfaction is number 1 priority. If you are looking for Resume Help that would land you in your dream job or advance your career to the next level, you chose the right company, creating your Resume is our Forte’, making an impression on the hiring manager when you are applying for jobs, is something that we strive for. Whether you have many years of experience, or no experience or transitioning to a new career, a professional resume created by one of our Resume Writers is exactly what you need. At Edmonton Resume Services, we offer many services including Professional Resume Writing, Writing Cover Letters, Linkedin Profile Development, Job Search Assistance, Job Interview Training/Coaching and Resume Distribution Services. All Resume Services are mainly conducted at our Head office in Edmonton, face-to-face. We are the only full-service Resume Writing Company in Edmonton conducting all our services from our Offices. Most companies would meet you for 40 minutes on the phone for your Resume writing services because they are based out of Ontario or States. At Edmonton Resume Services our clients have unlimited consultation and advice meeting us in person, face-to-face at our offices. Haven’t been able to get the job that you want, leave it to our professional resume writers and they will take care of it. With the help of our HR professionals, we will help you get more job interviews in the Industry of your choice. We will provide you with an excellent understanding of the job market, employer expectations and your professional marketing strategy to catapult your success. We train you how to conduct a professional job interview with our 1 on 1 interview training with one of our HR specialist and also panel interview training with our HR team (in certain industries) & help you understand how to get the best offers in your Industry. At Edmonton Resume Services, we make sure that all of our clients are 100% satisfied with all our services, we always put our selves in our clients shoes and knows what they are looking for during the Job Seek process. If your not sure about us or want to know about our services, upload your Resume now and one of our HR consultant will review your Resume and will get back to you with an action plan of how to take the next step forward. At Edmonton Resume Services, we have a wide range of flexible pricing plans for everyone at different levels, whether your a student, recent graduate or high level executive, we assist all clients in all different industries and sectors in their job seeking path. We always go above and beyond to exceed our client expectations. After submitting your resumes for our review, one of our professional HR administrative team members will review the documents, provide you with feedback and will support you with moving to the next steps within the process. Fair price. Quality professional service. Respond in a timely manner. Well worth the price. Sam is extremely professional, very knowledgeable and knows his job! He is helpful and responds to email almost immediately! I felt super comfortable talking with him and have no concerns contacting him if I have further questions!!!! I’d def use Edmonton Resume Services anytime!!! Did I forget to mention their super great prices. ? I applied for many jobs across many weeks with no results, After thinking of getting a more professional Resume, It made a huge difference with me getting multiple interviews right-away. I would recommend Edmonton Resume Services. Their services and prices are unbeatable. Sam was fantastic! He spent the time to ensure I was completely satisfied with my resume and did the edits quickly. I will recommend Sam to my friends and family. Great and fast service. Professional, knowledgeable and friendly staff. My experience to date was very professional and informative. I am now sending out resume and looking forward to may interviews. I have worked twice with Sam and each time I had a great experience with him and so far I am pleased with the work that he did for me. Sam is very familiar with the ATS system which a lot of recruiters nowadays use for filtering out job applicants. If you are willing to pay to have a professional resume done for you I would highly recommend Edmonton Resume Writers they are very professional and their prices are very competitive. Edmonton Resume Writers did an excellent job into transforming my old resume to a new professional resume, they were professional throughout the whole process. They did a great job into highlighting my accomplishments, skills and my overall experience. I am really impressed with my new resume. I would like to thank Sam and Edmonton Resume Services with their fantastic work on my Resume. I have been working in the construction industry for 20 years now and haven’t had to make a professional resume from a long time. I was laid off with no idea on how to complete a proper document that gets me hired. I have met with Sam where I sat with him and explained everything that I do, and thereafter I was given a new Resume that far surpassed my expectations. Very professional and amazing service, highly recommended. I loved my experience with Sam. He was thorough during our consultation, creating a beautiful and professional resume. Him and his team were also prompt to making adjustments and appropriate changes to accommodate my concerns. Service done promptly and professionally, would highly recommend to anyone. The staff were very welcoming, knowledgeable and understanding. Sam produced a very high quality resume and cover letter and Levi did wonders with my LinkedIn account. The practice interview session also taught me a lot about the interview process and Sam provided me with a great method for answering interview questions. The one shortfall was the job search which was very minimal; something that I could have done with 10 minutes spent on indeed. Overall, I was incredibly surprised with how lacking my CV and cover letter were before coming here so it’s well worth the service. I was not feeling confident after a few bad interviews and knew I needed help. I met with Sam and was amazed at how much he taught me – and in such a short time for a very reasonable price. I ended up being offered the job after my very next interview! Thanks Sam and your lovely assistant was also so nice to deal with. Great experience overall and I highly recommend this place! Sam and the team at Edmonton Resume Services were great. From the initial contact, they set up everything for me and made sure my experience was flawless. He delivered a professional, high-quality document that I am very pleased with. I was referred to Sam by a friend, and I would be happy to work with him again in the future. I contacted Edmonton Resume Services to rewrite my resume based on the good reviews I have read. I live in Calgary and have my resume writing session and interview coaching on Skype. Sam was very helpful and knows how to target his questions. I’m very satisfied with my experience and would recommend Edmonton Resume Services to all my friends. Had Sam write a resume for me. The consultation process was very collaborative and a great experience overall. Sam uses very targeted questions to get all the info he needs and despite the many pages of notes that he took, was able to tactfully edit it down to only two pages. The final product is a very well-worded and visually appealing resume. Thanks Sam!! Edmonton Resume Services did a fantastic job in transforming my old resume from what was relatively bland and outdated to a piece of art that precisely and confidently brought to life each skill set I have developed throughout my work history. Their process was very organized and straight to the point. During the writing session, I was asked few questions about my career and what I wanted to accomplish and ultimately what type of job I was seeking. So far, I have applied with my new resume to five jobs and already heard back from two of them, and it’s only been three days! With my old resume, I was only getting rejection e-mails. I highly recommend Edmonton Resume Services. 5+ stars all the way. Can’t beat it for the price. You will not be disappointed. I can’t believe it has already been over 4 years since the last time I had my resume written for the first time by Edmonton Resume Service. When Sam wrote my resume for the first time, it catapulted my career. I was quickly hired at a new position in the Oil and Gas industry and kept moving up from there. Now after 4 years, I needed a new resume with my whole new line of work, promotions, new skills, and totally different plans. This time, Sam totally outdid himself by going above and beyond to rewrite my resume with a new tone, different keywords, and new formatting. He researched my functions and wrote about important aspects of my job that I didn’t even think of mentioning. Once again, I was noticed by the right recruiters right away, and I have two interviews lined up this week. I am very happy with the results. I will always come back here at Edmonton Resume Service for updating my resume, cover letter, etc. They runs an extremely diligent and professional resume writing service. I recommend their work to any aspiring C Level professional. I had a very positive experience at Edmonton Resume Services. I found Sam very professional, knowledgeable and helpful. He answered all of my questions and made me feel at ease. When I had interview coaching I learned a great deal. Also my new resume gave me an opportunity for an interview for my dream job. I’m hoping I get it. We operate in the following areas.